As a born and bred southerner, having been raised in the East Anglian countryside, I'm pretty ashamed to say that prior to May 2018, the furthest north I'd ever travelled was to Newcastle. I know, I know, I was majorly missing out. However, at the end of last month I was lucky enough to spend a few days in Edinburgh, Scotland's capital city. I spent four action-packed days in the home of bagpipes, haggis, and whiskey, meeting up with a couple of my wonderful blogging friends along the way. I completely fell in love with Edinburgh, walking out of Edinburgh Waverly train station and taking in the amazing landscape and stunning architecture was a "WOW" moment that I'll never forget. I certainly didn't manage to visit everything on my hit-list in the city, but I did cram quite a lot into a very short space of time. 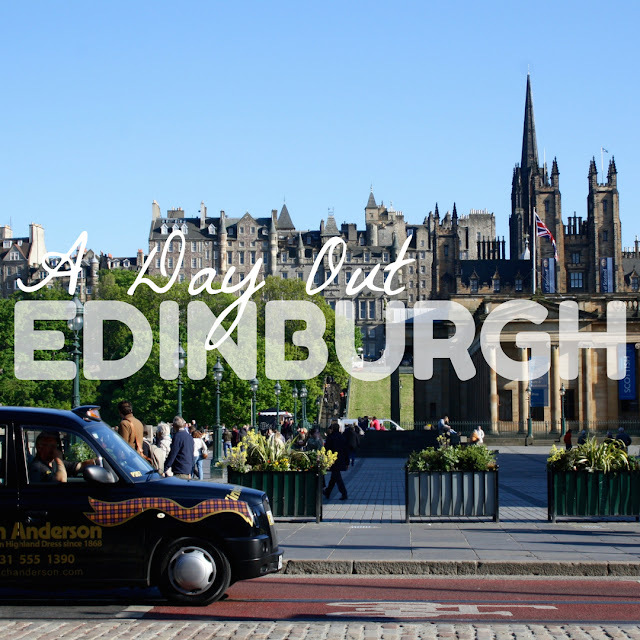 In the past I've really enjoyed writing posts about my days out in Oxford, Salisbury, and Norwich, so I couldn't resist putting together a sightseeing guide to Edinburgh as well. Keep reading to find out where my travels took me! To take in the best views of Edinburgh, I was told that climbing Arthur's Seat would be essential. However, as two of my days in the city were entirely occupied with PhD training, I just didn't have the time to take the four hour round trip to the top of the peak. Instead, the lovely Charlene and I wandered to the top of Calton Hill and the views from here certainly didn't disappoint. 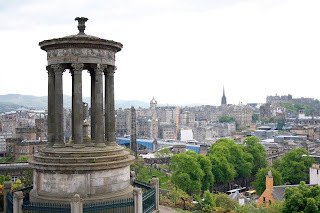 Calton Hill is located right in the city center and provides panoramic views of Edinburgh. It is home to an art gallery, the city observatory, and a monument commemorating Nelson which was erected after the Battle of Trafalgar. Also atop this hill is the unfinished National Monument of Scotland, which was intended to be a replica of the famous Parthenon in Athens. However, building work was abandoned shortly after it began, leaving just a few columns on the top of the hill. 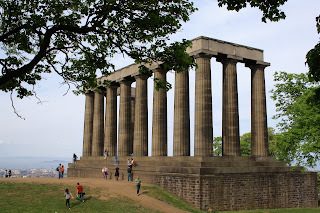 The walk up Calton Hill took no time at all and I would heartily recommend it as an alternative to Arthur's Seat for the time-strapped traveller. 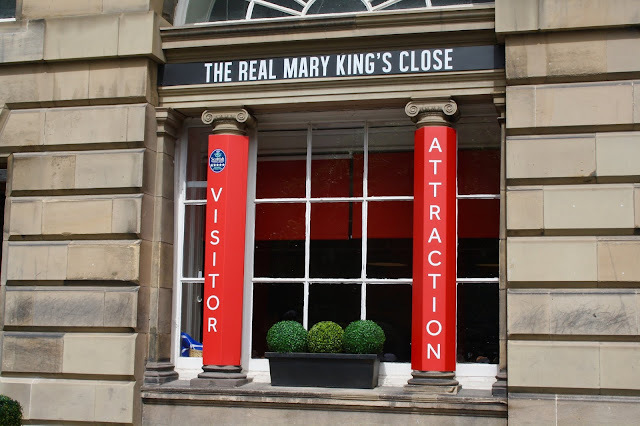 A spooky yet fascinating glimpse into Edinburgh's past is in store for visitors to the Real Mary King's Close. 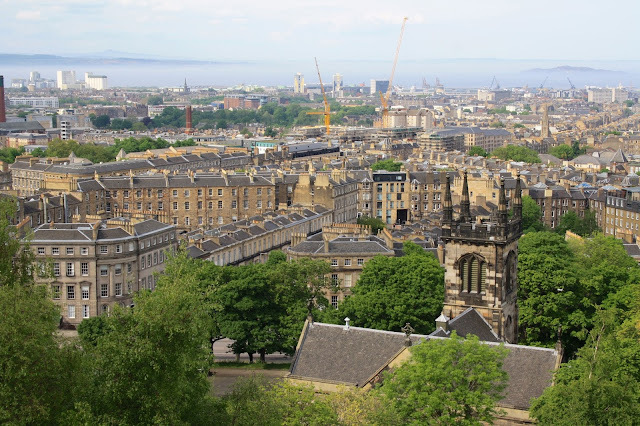 The wonderful Beth booked us a pair of tickets to travel back in time and discover Edinburgh's history, hidden away where you'd least expect it. Descending below the street level, a costumed guide (a seventeenth century wine merchant, no less) walked us through the old streets and houses of the city which are still preserved today. We were able to get under the skin of the plague epidemic, learn about the rather rudimentary toilet facilites in the old town, enter a room supposedly populated by a terrifying ghost, and uncover how all social classes lived together stacked on top of each other in tenements that are said to have been the world’s first skyscrapers. No cameras were allowed inside the tour so I have to apologise for the lack of photos, but this was such a fantastic experience that I never would have considered without Beth's suggestion. I have her to thank for a truly memorable morning! Are you ready for a story that will break your heart? If you're an animal lover, have your tissues at the ready. 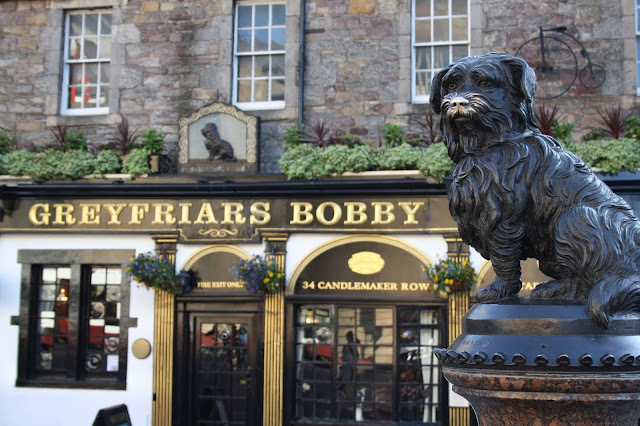 A well-known Edinburgh tale dating from the ninteenth century inspired the erection of this statue of a Skye terrier and the pub that bears his name. The story goes as follows: Bobby the terrier belonged to a man named John Gray who worked for the Edinburgh Police as a nightwatchman. When John Gray died, he was buried in Greyfriars Kirkyard and Bobby, who survived him, spent the rest of his life, fourteen long years, sitting at his master's grave. Bobby died in 1872 and was buried close to his beloved master. A year later, an Englishwoman, Lady Burdett-Coutts, erected at a water fountain topped with a statue of Bobby at a junction close to Greyfriars to commemorate him. When I heard this story, I just had to pay Bobby a visit. He is both a heartwarming and heartbreaking piece of Edinburgh's history and definitely worth a look. 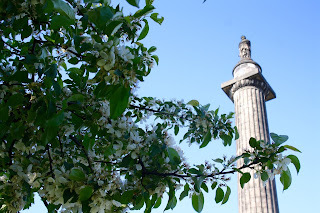 If wandering around the city has taken its toll on you and you're looking for a sunny spot to sit down and rest your legs, you're in luck as Edinburgh has plenty of green oases. St Andrews Square is a beautiful spot on a sunny afternoon, marked out by the impressive statue of the Viscount Melville that stands in the centre. 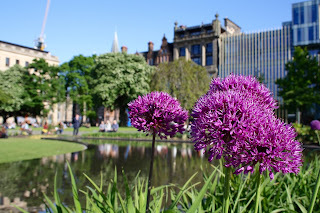 Although the square is surrounded by commercial offices and banks, the picturesque grassy area was mostly populated by tourists and families during my time in the city, eating ice creams and enjoying the gardens. I would definitely return! As a museum studies PhD student, it would probably be heresy not to mention at least one museum or gallery in this blog post! If you follow my Instagram stories, you'll have seen how much I enjoyed my visit to the National Museum of Scotland. The architecture of the place was absolutely breathtaking and they had some amazing exhibits too, including Dolly the Sheep, the first mammal ever successfully cloned from an adult cell, and an incredible room dedicated to contemporary fashion, design, and textiles. 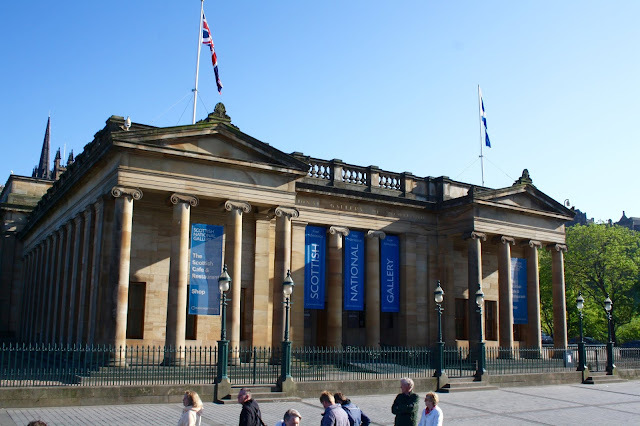 The National Portrait Galleries were another highlight for me, especially as during my training sessions, I was able to hear about how the exhibitions and displays were put together from the gallery's curators. The Scottish national pride was very evident in the Portrait Gallery, as Scots past and present were commemorated in pictorial form. I especially enjoyed seeing the portrait of Naomi Mitchison, a novelist, poet, and social rights activist who played a key role in campaigning for womens' access to birth control. I didn't have the chance to see everything I'd have liked to in these museums so I'll definitely be back! Last but by no means least on my whistle-stop tour of Edinburgh comes St Giles Cathedral. Also known as the High Kirk of Edinbugh, the Cathedral stands on the Royal Mile, the main thoroughfare in the city. 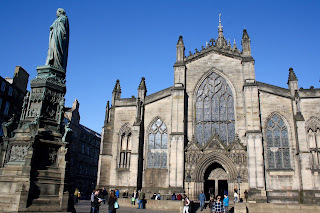 The Cathedral was first built way back in 1124, and is dedicated (surprise, surprise) to Saint Giles, who is patron saint not only of the city of Edinburgh but also of lepers. The Cathedral has a very colourful history as it was the scene of riots in the seventeenth century due to religious reform. The action supposedly kicked off after a market seller threw a stool at the preacher's head when he began to read to the congregation from an Anglican book of prayer! Now I don't know about you, but that's something I would've loved to witness! 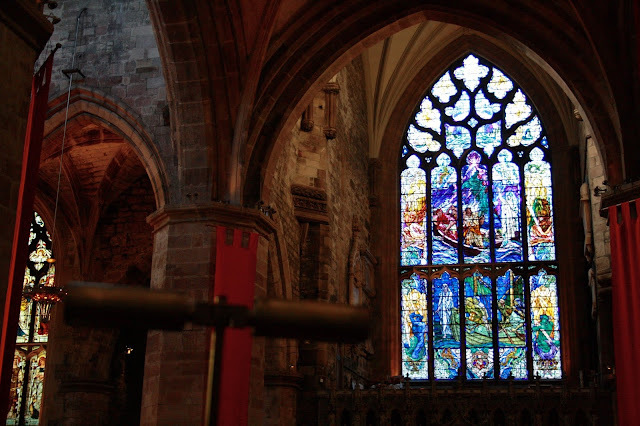 Today, the Cathedral is an absolutely beautiful place to visit due to the stunning stained glass windows. 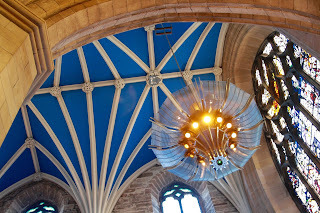 The ceiling also put a big smile on my face as it is painted blue with white crosses, recalling the Scottish flag. I had an absolutely fantastic time in Edinburgh, thanks in no small part to the wonderful people that I was able to spend time with. It was a real pleasure to finally meet Beth and Charlene, two ladies that I've known from the very beginning of my blogging career, who I've come to consider some of my closest friends. Edinburgh, I will be back! I just hope Beth and Charlene don't get sick of the sight of me! Have you ever been to Edinburgh? Where should I make sure to visit on my next trip? Comment down below!